The Church has announced translation projects for LDS scriptures, plus a new process to publish them online a portion at a time rather than waiting for the entire book to be completed. The Book of Mormon in Burmese, Efik, Georgian, Navajo, Pohnpeian, Sesotho, and Tshiluba. Triple combination in American Sign Language, Afrikaans, Amharic, Arabic, Bislama, Burmese, Efik, Georgian, Greek, Hiligaynon, Hindi, Hmong, Lao, Lingala, Malay, Navajo, Persian, Pohnpeian, Polish, Serbian, Sesotho, Setswana, Sinhala, Slovak, Slovenian, Tahitian, Tamil, Telugu, Tok Pisin, Turkish, Twi, Urdu, and Yoruba. 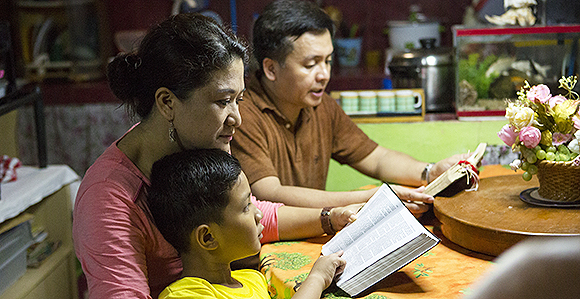 Scripture translation projects typically take many years of careful work to complete. To allow members earlier access to these translations, as translations proceed, completed portions will be released in sequence from time to time on LDS.org and in the Gospel Library app. These sequential portions are not considered final until the full translation is completed. As translations are fully completed, with the necessary reviews and approvals, the earlier sequential portions will be replaced by final versions, with printed editions to follow. When these sequential portions of scriptures are posted online, if they contain the Articles of Faith, sacrament prayers, or baptismal prayer, they are not considered official until the translation of the entire book of scripture is reviewed and approved. Therefore, members and leaders should continue using the current translations of these items until new translations are complete.